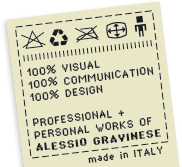 My name is Alessio Gravinese and I am a self-motivated and resourceful Italian Visual Designer / Art Director with 9+ years experience in Italy and South Korea. I am a graduate from the Polytechnic of Milan with a BA and an MA in Visual Communication Design. I got a deep passion in everything related to graphic, printing and design. I have been responsible mainly for projects related with Philip Morris Korea and Philip Morris International, working occasionally with other clients such as Mc Donald's, FIAT, Cenovis and Coca Cola. My expertise varies from Art Direction, Advertisement, Graphic Design, Editorial, Branding, Packaging design, and Printing.I believe in the power of creativity to communicate, to seduce and to sell. Image is everything in a media-soaked world like ours, and that’s where I come in: It’s my job to successfully translate desired moods, messages, concepts and underdeveloped ideas into imagery, and to be sure to find the right strategy to meet the desired requirements. I have been living in South Korea for the last 8 years, during which, i developed a deep knowledge of Korean lifestyle, culture and market, still maintaing my foreigner background and approach to life and work. I am always looking for a new challenge, one which will make best use of my existing skills, but also give me the opportunity to improve my personal and professional development. FLOKLO, WHAT DOES IT MEAN? Since the first time I have visited Korea in 2006, I have been fascinated by the korean alphabet and the thousands of shops sign, but of course i wasn't able to read any of them. One day I saw this word"공증" and of course i couldn't read it. So I tried looking at it from another angle, and I turned my head of 90 degrees on the right, and I read it: "FloKlo". From that day, I am using this word as a my design identity.